As an animal lover, you may come to face situations in which you have to provide first aid for an animal. Of course, the hope is that this never happens, but if it does, it is good to know what to do. Below you will find an overview of the most common situations in which you as a pet owner can provide first aid. Most pets will at some point have a wound, or stitches following surgery. When this is the case, it is useful to know how to care for wounds. First of all, it is essential that the wound is kept clean. You can clean the wound using a syringe with (cooled boiled) water or rinsing liquid, but you can also use gauze with a disinfectant, such as Betadine solution. A good wound ointment, such as Dermiel or Vetramil, will speed up the healing process. If necessary, you can bandage the wound with sterile gauze and bandages for small pets. You should replace the bandage daily and check the wound. If the wound becomes red, thick, warm and/or has pus coming from it, it is important that you go (back) to your veterinarian for assessment and (in some cases) additional medication. Animals have a natural instinct to lick their wounds. In principle, this "cares for" the wound. Do ensure that they do not lick it excessively, as this may deteriorate the wound. To stop excessive licking, you can temporarily use a protective collar or a Medical Pet Shirt. Bites or fighting wounds must always be assessed by a veterinarian. These wounds practically always become infected and nasty infections and abscesses can occur without the right medication. In some cases, wounds need to be stitched up. A wound should be stitched within 6 hours of the event; within this time the edges of the wound can still grow back together. Ear wounds (following a biting incident or an accident with barbed wire, for example) can bleed heavily. These wounds must often be stitched in order to ensure that they don't keep bleeding. You can try to apply a "head bandage" to stop the bleeding before you go to the veterinarian. When applying a head bandage, the affected ear should be placed on top of the head, with the inside of the ear facing out. You can then apply the bandage in such a way that you alternate going in front of and behind the other ear. Please ensure that the throat area is not restricted by the bandage. Watch this video for instructions. For smaller dogs, it might be possible to use a cut-open sock as a temporary bandage by sliding it over the dog's head. A nail can also bleed quite a lot when it is wounded or cut just a little too short. Press a piece of gauze against the nail and bandage it with a Petflex bandage. This can be bandaged tightly. Remove the bandage after 15 minutes so that the blood supply in the paw is not cut off. Animals often get their nails caught in places. This may cause the nail to tear (partially). You can cut the loose part of the nail off if you like. If you can't, or prefer not to, you should take your pet to the vet. Often, the sensitive area is exposed due to the wound. This may be sensitive for a number of days and could become infected. Clean the nail every day and wrap a bandage around it if necessary (not too tight!). Has your pet been hit by a car? Try to stay calm and call your veterinarian as soon as possible. Your veterinarian will ask you a number of crucial questions and give you a number of initial directions. Stay with your animal to calm it down. Stabilising the animal is the most important thing you can do in the first instance. In any case, you should make sure that the airways are free, that you support the animal where needed and keep it warm using a blanket or a coat. If the animal is trying to find a comfortable position, please allow it to do so. For example, if an animal is struggling to breathe, it will prefer to lie on its front rather than on its side. Is the animal bleeding? Try to put pressure on the area that is bleeding or to apply a pressure bandage, using a scarf or a piece of a t-shirt if necessary. It is important that the animal is not moved too often and is transported to the veterinarian calmly and with care. When you suspect your animal has a fractured bone, it is important that you do not manipulate the affected paw when you pick up the animal. You should leave it hanging. If, for whatever reason, your pet is unconscious, has stopped breathing or if you can't feel its heartbeat, you can try to reanimate it. This keeps the vital transport of oxygen in the blood going. Reanimation consists of cardiac massage and/or mouth-to-nose resuscitation. You can check the animal's heartbeat by placing the palm of your hand on its chest, just behind the elbow. Another place where you can feel the heartbeat in the groin, on the inside of the thigh. You can check the animal's breathing by holding your hand in front of its nostrils and watching its chest move. If you are resuscitating the animal, have someone call the veterinarian in the meantime. Can't feel a heartbeat? Place the animal on its right side with a straight neck if possible. In most cases, animals without a heartbeat have stopped breathing. In this case, cardiac massage is more important than resuscitation. The purpose of the cardiac massage is to exert sufficient pressure for the blood to be pumped around from the heart. If there are several people present, you can perform a combination of cardiac massage and resuscitation. The heart of a pet is in the lower half of the chest, behind the elbow of the left front paw. Place the heel of your hand (in small dogs place a thumb and index finger on both sides of the chest). Make 1 or 2 strong pumping motions per second. Regularly check whether the dog has a heartbeat. If you cannot feel a heartbeat after several minutes, the chance of the animal coming back is very small. Has the animal stopped breathing? The animal may still have a heartbeat, check whether you can feel one. If the animal still has a heartbeat, you can resuscitate it. If the animal does not have a heartbeat, please perform cardiac massage as described above. When performing resuscitation, place the animal on its right side with a straight neck if possible. Check that the airways are free. Open the animal's mouth and let their tongue hang out. Remove any obstructions (mucous, vomit, objects). Is the animal still not breathing? Then you can perform mouth-to-nose resuscitation. Fold your lips around your dog's nose and put your hands around them. Carefully blow air into the dog's nostrils. Make sure that you do not blow with too much force. A dog's lung volume is (many times) smaller than yours! Repeat this action around 5 times per minute until the dog starts to breathe. If you are alone and want to perform both cardiac massage and resuscitation, the best thing to do is alternate 10 seconds of cardiac massage with 1 mouth-to-nose resuscitation. There are several (food) products that may poison your pet. The most well-known ones for dogs include chocolate, grapes and raisins, paracetamol/ibuprofen, rat and mouse poison, cleaning products and antifreeze. Products that are especially toxic to cats include lilies, paracetamol and permethrin (active substance of flea treatment for dogs). You can find more information about products that are poisonous to pets on the licg site. What can I do as the pet's owner? If you suspect that your pet has eaten one of these products, or if your pet shows symptoms of poisoning (acute vomiting/diarrhoea, anxiety/agitation, lethargy), please contact your veterinarian immediately. Important information to give your veterinarian includes your pet's weight, the composition of the product and how many mg/ml you believe your pet has ingested. If you have accidentally given your cat flea drops for dogs, it is important that you wash the area where you applied them as quickly as possible using a mild shampoo or soap in order to minimise absorption through the skin. Then contact your veterinarian immediately. Cats and dogs can sometimes have a tendency to ingest strange objects. You name it and it has been eaten by a cat or dog at some point. For example, some dogs like to eat socks, gloves, tennis balls, rubber toys, flossing ropes, sticks or wooden skewers. Cats are more likely to eat rubber earplugs or wool threads. During a fun night of barbecuing, make sure that any wooden skewers with food leftovers are kept out of the dog's reach. You should never leave your pet alone with any toys. If you see or suspect that your animal has eaten an object, you should contact your veterinarian immediately. If you wait too long, the ingested objects may have serious consequences and damage the intestines or cause a blockage. It is often recommended that you feed your pet gingerbread in order to "envelop" sharp objects, but this is not sufficiently effective. Administering salt water to induce vomiting is not recommended either. In many cases it doesn't work, and can also cause dehydration. You veterinarian will decide and administer the right treatment (an injection to induce vomiting, an endoscopy or surgery). You may not notice that your pet has eaten a strange object. If your cat or dog has persistent vomiting, is lethargic and appears to be constipated, this can be an indication for a blockage in the intestines. If you notice these symptoms, please contact your veterinarian as soon as possible. Wasp and bee stings, and mosquito bites can lead to allergic reactions. This is manifested by swelling, redness and pain. If your pet has been stung and you can still see the stinger, try to remove it with tweezers. You can counter the swelling and pain by cooling the area. If the swelling continues and your dog is suffering, please contact your veterinarian. Some cats and dogs enjoy catching flies with their mouths. However, if they do this with wasps and bees and get stung in their throat or tongue, this can be dangerous. Swelling in this area can cause breathing difficulties. If this happens, contact your veterinarian immediately. Check your pet for ticks daily, especially after a walk in the forest. It is important that you remove the tick within 16-24 hours of it burrowing in. At this time, there will not yet be a connection between the stomach of the tick and its host (and therefore no diseases will have been passed from the tick to the host). You can also remove a tick by using a tick remover. Ensure that the tick is visible by parting the cat or dog's hairs and place the tick remover as close to the skin as possible. Make a rotating movement until the tick is released. In contrast to some stories, it does not matter whether you twist to the right or to the left. Do not pour alcohol over a tick. This will cause it to vomit up the contents of its stomach and transmit possible diseases. After removing the tick, check that the small black part, the head, has also been removed. If the head is not removed, this can cause an infection. Is your pet having an adverse reaction to a tick bite? Get your veterinarian to check it over, just in case. Ticks are easy to remove, but preventing ticks is better. It is therefore important to provide a good tick prevention during the tick season. We offer various anti-tick products for this. The ticks will still bite, but will die quickly and fall off. Lameness is always a sign of pain, despite the fact that many dogs will not whine or cry. Acute lameness can have several causes. It can be caused by a traumatic event such as fighting, overloading, the wrong jump or a sharp object in the paw pad. Always check the paws for objects, and check that there are no wounds between the toes or on the nails. When you have removed a splinter or a piece of glass for example, it is important to keep the paw pad clean in the following days using Dettol) and applying a bandage when you go out. To care for a nail injury, see "bleeding or torn nail" above. If you cannot find the cause of the lameness, and it continues for a number of hours, please make an appointment to see your veterinarian. If you suspect that your pet has a fracture, do not examine or manipulate the paw yourself, as this is very painful and will only cause further damage. If you pick up your pet, make sure that you do not touch the paw, just leave it to hang down. Has your pet been injured by boiling water or has it incurred a burn? Cool down the affected area as quickly as possible using tepid water. Do this for at least 10 minutes. Please contact your veterinarian in the meantime. In summer, your pet may be at risk of overheating. This may be caused by a lack of shade or an excessively hot environment (such as a parked car on a hot summer day). Dog breeds with short noses (such as French/English Bulldogs and Pugs) are at a higher risk of overheating. The consequences of overheating can be very serious. That is why it is important to cool down the animal as quickly as possible. Dogs cannot sweat and can only lose their body heat through the soles of their paws and by panting. When a dog overheats, it will start panting to release body heat. Due to the exertion caused by panting, the dog's body heat will actually rise further. It is therefore vital that you take action and consult your veterinarian. It is important that you administer first aid yourself by cooling your dog down as soon as possible. Bring your dog out of the sun immediately, put a wet towel over it or let your dog lie/swim in the water. If you are able to, sometimes the best thing to do is shave a dog with a thick or long coat. Make sure that the dog has fresh drinking water available. Your veterinarian can examine the animal further and place a drip or take additional measures if needed. The risk of overheating can be reduced through the use of the Aqua Coolkeeper Collar. This collar contains an active cooling gel and cools the animal's neck and therefore the large blood vessels that run through the neck. We also offer the Aqua Coolkeeper Coolmat. It is always a good idea to have a First Aid kit in your house, or to take this with you on holiday or day trips. A good First Aid kit should include bandages, such as sterile gauze, betadine or iodine wipes, wound dressings, leukotape, scissors and protective gloves. Nail clippers are needed for torn nails. Tick removers should also be part of the First Aid kit. We also offer ready made First Aid kits such as the Duvo pet first aid kit as part of our range. Offering first aid in the event of accidents is intended to save a dog's life, alleviate its suffering and/or prevent its wounds from deteriorating. In addition, you should ensure that the animal can be transported to the veterinarian safely. A First Aid course offers you the theoretic and practical knowledge needed to administer first aid. 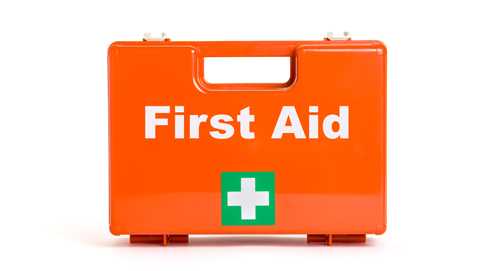 Several First Aid courses can be found online. You can take out insurance for your pet in order to cover any veterinarian costs. Ask the insurance companies for the conditions and premiums. You can also choose to create a "piggy bank" for your dog, to cover unexpected costs. Comfortable protective collar to prevent biting & licking. Promotes healing of small & large wounds. Everything you need to tend to injuries. Versatile pain reliever for cats, dogs & horses.